A wrap-around knee support with CoolPrene material that dissipates heat and reduces perspiration and heat discomfort. 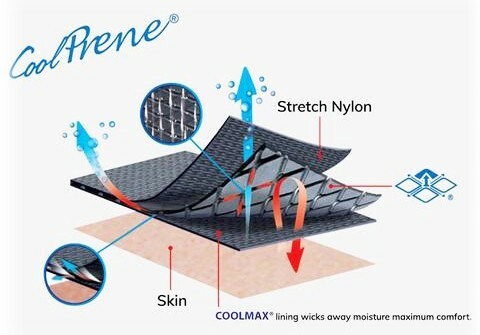 CoolPrene dissipates heat during use to reduce or avoid undue perspiration and heat discomfort, especially during prolonged use. When CoolPrene brace is in use, it stretches in a bidirectional manner, creating a pumping action to allow fresh cool air to flow through the channels, while a certain amount of heat and moisture is able to pass from the skin surface to the outside of the brace through the slits of the CoolPrene. The slits open when the brace stretches, creating an air flow path.